ELS/St. Petersburg is located on Eckerd College’s beautiful and spacious waterfront campus in Florida’s tropical west coast. While studying English in St. Petersburg, students can learn how to kayak, canoe, sail and paddleboard, and visit the city’s pristine white sand beaches. In the video, ELS student, Scarlet, talks about matriculating to Eckerd College. “I love ELS because they made me write a lot. It gave me a starting point for my college writing. When I write a research paper or an essay, I always think about the classes I had at ELS and how they help me,” Scarlet said. Eckerd College is a private, coeducational college of liberal arts and sciences with a diverse student body of 1,800 students from 48 states and 40 countries. Eckerd’s suburban setting provides a safe environment for students and easy access to all the cultural, social, and athletic activities of a major metropolitan area. Learn more about ELS/St. Petersburg. 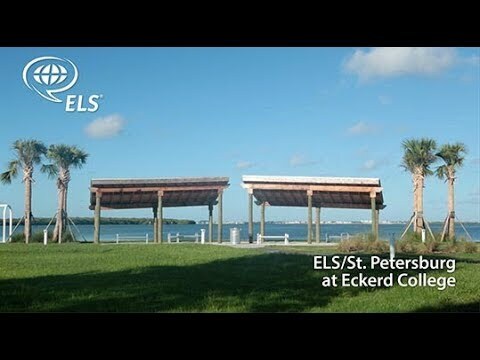 Learn more about Eckerd College.